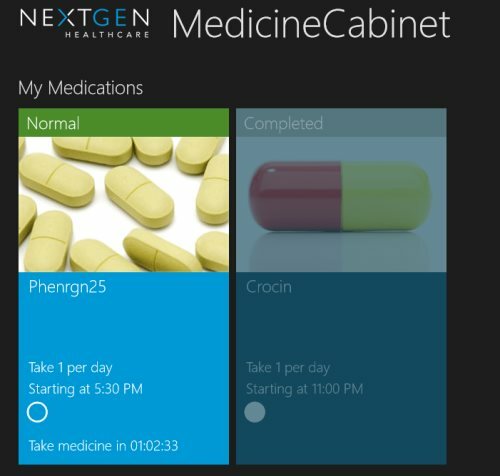 MedicineCabinet is a free Windows 8 Medication Management app that helps in calculation of dosage that you take throughout the day. 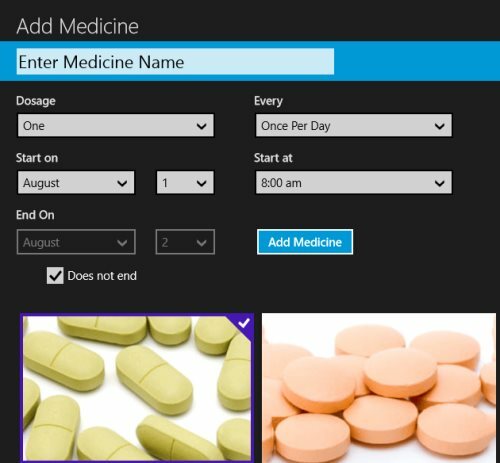 Over this app for Windows 8, you can manage a list of medicines along with scheduling them as to when to take a particular dosage at for how long so that you do not miss even a single highly important medicine. In addition, this Windows 8 medication management app keeps you abreast with all medical info about which medicine did you miss throughout the day. You will be always aware about the medicine that you are required to take next. You can also track you medication history which tells you when did you last took a selected medicine. Now, to track the history of each medicine, just right-click on a medicine?you will be displayed with different options at the bottom?click on “More” option to read the history or scheduling time of the medicine. Also, you can delete a medicine once you are done with the number dosage you were supposed to take. The good part is that this Windows 8 app itself will blur the medicine once it identify that you are completed with dosage. The “Edit” option lets you edit the scheduling time or date of the selected medicine. Initially you will find zero number of medicines at you wall. Now, to add a medicine and its medication, just click the right mouse button anywhere on the screen. Click on “Add” option displayed at the bottom of the screen. Once done with this step, click on “Add Medicine”. Yupp..you are done. similarly you can add more medicines depending upon your daily dosage. Go ahead and try MedicineCabinet Windows 8 medication management app now. Its a must trial for all patients to get well soon..All the best!